Dr. James Duncan, Associate Professor of Communication at Anderson University, has written “Holy Rage at the ‘Spring,” a detailed account of his recent experience with NewSpring Church (Perry Noble’s church). Some of Dr. Duncan’s content is not suitable for all ages as he retells the story of what happened and what was said – reader discretion is advised (language, sexual references – as he quotes NewSpring’s people). Apparently, this all started once Dr. Duncan began to criticize Noble/NewSpring on his blog! Recently, certain events occurred that Pastor Perry and the Church’s leadership feel the NewSpring Church family needs to know about. Earlier this year, a critic of the church from the Anderson community created a critical blog site and posted numerous blogs disagreeing with the methods of NewSpring Church and the messages that Pastor Perry has preached, including basic theological doctrine. I apologize to you that this has happened during finals week. None of us needed the additional stress right now. To those of you who attend NewSpring, my complaint is not with you or the many other people who also attend. It is strictly with a set of staffers and insiders who seem to have lost their senses in dealing with me and my family. We have friends and neighbors who attend NewSpring that we continue to love and support. And later today Dr. James Duncan will be a guest on the Fighting for the Faith (FftF) radio program of Christian apologist Chris Rosebrough. FftF can be heard on the Pirate Christian Radio network at 6PM Eastern Standard Time. 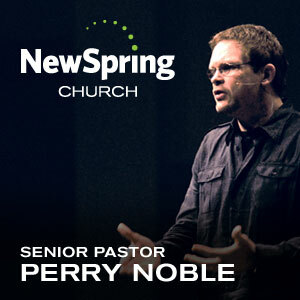 PERRY NOBLE REBUKES ROB BELL! ?